Where in the US Do You Find Straw Itch Mites? If you live in the Southeast, Southwest or Midwestern United States and handle a lot of hay and straw, beware of the straw itch mite (Pyemotes tritici). This minute creature originated in southern Europe but was introduced to the American South and has since spread northward and westward. Straw itch mites bite people, causing severe itching and a rash. Severely affected individuals might experience joint pain and fever. Also known as grain or hay itch mites, four-legged straw itch mites are so tiny that males can't be seen with the naked eye, while females can be seen only after they've feasted on an insect, animal or person. After eating, the female's eggs develop, and within a few days she gives birth to up to 300 adult mites. Male mites then breed with the newborn females and all head off to find new areas in which to feed. These mites consume various arthropods and larva. In the South and Southwest where the red fire ant (Solenopsis invicta) is an invasive pest species, straw itch mites are sold commercially as a form of biological control. The mites eat the red fire ant larva after placement in the ant mounds. Cultured on wheat seeds, the mite-containing seeds are dropped into the mounds. Straw mites live throughout the continental U.S., but are especially prevalent in areas producing large amounts of hay, grain, cotton and beans. The mites have spread easily since their introduction in the South in the late 19th century, traveling with crop shipments throughout the country. If the winter or spring has been especially wet, mite infestation in susceptible crops appears to be higher come summer. 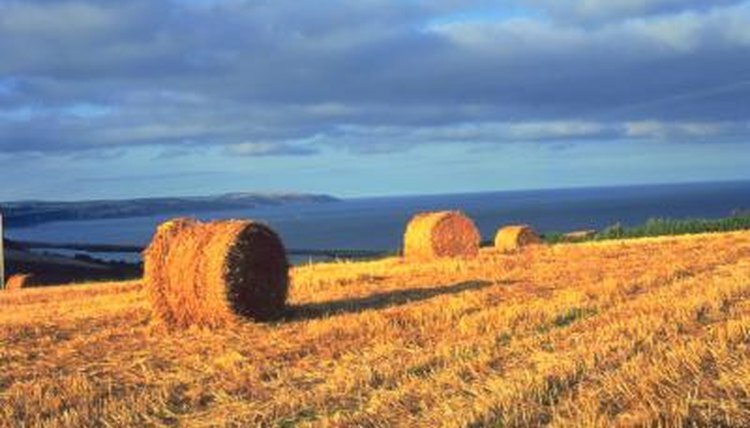 Mites in baled hay and straw usually disappear once the weather turns cold. Once the temperature dips below 65 degrees Fahrenheit, mites aren't likely to bite people and it's safe for humans to handle the infested hay, straw and grains. Unlike other insect bites, the bites of the straw itch mite usually occur on clothed areas of the body, often the arms or the trunk. The University of Florida website refers to the straw itch mite as "the most prevalent insect parasite that also attacks humans." Depending on the victim's exposure level, he might experience just a few bites or literally hundreds. The telltale welts appear and itching starts within 24 hours of the biting. The welts might develop a "head" and resemble tiny pimples. Most cases runs their course within a week and don't need treatment, but severe reactions or infections require medical attention. If you work in the fields or handle hay and straw in hot weather, wash your clothes every day. If throwing hay to livestock or putting straw in stalls, wash your hands with soap and water as soon as you've finished these chores. Alfalfa and Forage News: Is Your Hay Biting You?